The Wii U has struggled since it was launched in late 2012. That might be bad news for Nintendo bean-counters but it might be good news for Nintendo fans, especially if this month's big E3 show is anything to go by. At E3, I talked to two of Nintendo's most senior people about the state of Nintendo's console. Nintendo of America president Reggie Fils-Aime sparred with me about how the Wii U has been doing and pledged that the console "has a very long life ahead of it." 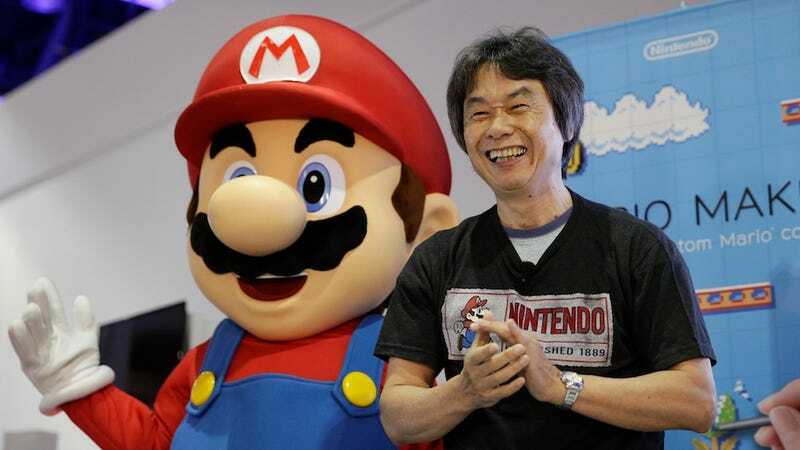 Nintendo's senior game designer, Mario and Zelda creator Shigeru Miyamoto, admitted that times have been tough, but found hope, saying that "In my years with Nintendo what I've found is that it's always in those difficult times that we have a tendency to find that next new thing." I discussed other topics with both men, but what follows is what we discussed about Wii U. (More on the other stuff later.) I think Nintendo fans will find some hope in both exchanges. Stephen Totilo, Kotaku: [Regarding the] Wii U, I saw a lot of titles announced for it. Coming into the show—and you've seen this as well—a lot of people would say, 'Why is Nintendo still even backing the Wii U? It is not doing well enough. It is not a Wii-level phenomenon.' Some consider it a failure. Reggie Fils-Aime, Nintendo of America: Oh, by the way, there's been only one platform that has been anything close to the Wii level of long-term success. [laughs] Just look at home consoles. There aren't many home consoles that do north of 100 million units. Totilo: Right. But you guys don't have much third-party support right now. Fils-Aime: Right now being the operative word. Totilo: You had more before. You had Yves Guillemot saying to Brian Crecente—who I believe is a reputable reporter—that they're actually holding back finished software until you guys can build the installed base. And, in general, the attention is on very big sales figures for the Xbox One and the PS4. And so I don't know what Nintendo would do about that… and I had a hard time imagining that Nintendo would just bail out on the console, and instead what I saw [at this E3] was more commitment to it at least through 2015. How do you see the Wii U's position right now? It has struggled, I think you wouldn't deny that, but how do you see it? Fils-Aime: I wouldn't use that word. Totilo: What word would you use? Fils-Aime: Look, we've been very clear that the number of games that we've launched essentially July through the end of last year, a number of those games we had hoped they would be launch window games, everything from Pikmin to Wii Party U, we wanted all of that content to launch much sooner. Our belief is that software is what drives hardware and if that would have come earlier we might be having a different conversation. But the fact is we are where we are. The last numbers we announced at the end of March is that the Wii U had sold north of six million units on a worldwide basis. Our goal is to provide compelling content to drive that installed base. Because we know only with a large and vibrant installed base will third part really jump in with the range of their content. Totilo: The company has lost money lately, which is unusual in its long history, and if you look at 3DS it started sluggishly, there was a dramatic price cut and that helped turn that business around. If someone comes to you and says, 'Reggie, just refresh, just start over, do a new console, do-over,' You say? Fils-Aime: I say, 'No.' And the reason I say that is because we believe the Wii U has a very long life ahead of it. It's got great content coming that will help define the platform. For us, we think the 3DS is a very illustrative example. It wasn't just the price cut. It was having great content that started with Kart 7 and 3D Land and then progressed and created a larger and larger footprint. We just launched Tomodachi Life. The Tomodachi Life numbers were significantly stronger than we had forecasted and planned. That's because it's a vibrant platform. That's exactly what we need to do with the Wii U, and we do believe that content like Splatoon, content like Hyrule Warriors, content like Mario Kart 8 that we just launched, content like Smash Bros. for Wii U, that is what is going to drive the installed base. Totilo: I don't know if it's going to drive the installed base, but Captain Toad [for Wii U] is my kind of game. Fils-Aime: Captain Toad is a phenomenal game. A game I fought for to make sure we included it in this year's E3 is Yoshi's Woolly World. I saw that when I went to Japan earlier in the year. It's a fantastic game. And what's interesting is that for many more advanced gamers are going to say '-pbbbbt-, I don't want to play that.' But it's amazingly deep. There's a lot to that game that we haven't even shown yet. For me that's one of my personal favorites. A day later, I was talking to Miyamoto in a joint interview that also included Shinya Takahashi, the head of the development teams at and near Nintendo that aren't overseen by Miyamoto. I presented a similar query about the Wii U to them, mainly to Miyamoto, who I'm more familiar with. I told him that I felt that the Wii U was struggling but that I'd seen, perhaps as a result of that, a bolder, more experimental Nintendo at this year's show. Just a few days before, I'd been playing some of his Wii U experiments, after all. And I'd played Splatoon, Nintendo's new, unusual third-person multiplayer-centric shooter. So, yeah, I suggested to him, this feels like a bolder Nintendo. "I'm happy to hear you say that," Miyamoto replied, through a translator. "Certainly we've had tough times before, but the numbers have never been as bad as they are now. In my years with Nintendo what I've found is that it's always in those difficult times that we have a tendency to find that next new thing. And I think that maybe we're seeing a little bit of that [now at E3]. "We also have younger members of the team now, and they're wanting to create their own games and have their own ideas. Splatoon is a good example of that. That's being made by some very young members of the group. They're having a lot of freedom to create the game that they want. "And of course we just finished Mario Kart, and what's now going on is that a lot of the people working on Mario Kart, their hands are free and they're coming up with ideas and doing a lot of experimentation with what they can do with two-screen gameplay and they're having a lot of fun doing that." In that same set of interviews, I talked to the Nintendo men about their Amiibo figurines, the Skylanders-like statues that Nintendo will sell in the fall and use to store character data across Smash Bros., Mario Kart 8 and other games. Takahashi told me that Nintendo had long wanted "to have a series of these toys that worked not just with this one game but with multiple games." He and Fils-Aime both said that the Amiibo had been born of Nintendo's commitment to launch the Wii U GamePad with embedded near-field-communication technology that allows it to exchange data with specially-coded objects near it. Fils-Aime talked about that tech as also being used potentially for buying things. I didn't get any information about who is making the figures or how they'll work outside of Smash Bros., but as with many things I've discussed with Miyamoto over the years, he was able to draw a line connecting Amiibo back to an earlier Nintendo concept. "If you think back it's very similar to what we did with the eReader, the card readers that existed for the Game Boy Advance. I had been wanting to have not as an optional accessory but as a built in piece of functionality the ability to have this interaction of reading and saving data with a physical object for quite some time. And that was why we made the decision to include it with Wii U to begin with. And since the launch of Wii U we've been thinking of what's the most appealing form factor for a physical object that has this functionality that people would see it and just want to own it and ultimately we decided that it was the characters themselves." Look for more coverage from my interviews with the powers that be at Nintendo in the coming days. Unless you're a Zelda fan. Then just read this.